When it comes to Bayswater, W2 London, the first thoughts that come to mind are ‘diverse’ and ‘cosmopolitan’, but there is much more to this delightful area. Located in the borough of City of Westminster in the West of Central London, just three miles from Charing Cross, Bayswater is next to popular areas such as Notting Hill and Marble Arch. It is situated over Kensington Gardens, just north of Hyde Park, which is one of the largest green spaces in London. The area boasts great shopping opportunities and restaurants, as well as leisure and entertainment options. Bayswater is home to the busy high streets of Queensway and Westbourne Grove, as well as Whiteleys Shopping Centre, which provide high-quality shopping experiences and restaurants to suit all kinds of tastes. Bayswater also has several super transport links to and around London, and is near Paddington Station, one of London’s major railway and underground station that connects to Heathrow Airport directly. 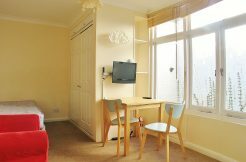 It is also within walking distance of several tourist attractions and Oxford Street. Bayswater is a largely residential area with pretty green streets and garden squares that are lined with Victorian stucco terraces, most of which are now subdivided into smaller dwellings. Property here ranges from small studio flats to expensive apartments, ensuring there is something for everyone here. Are you interested in properties for sale in Bayswater? We have put together a comprehensive (and interesting!) guide about all you need to know about Bayswater. From its history and top attractions to shopping and dining options and more, read on! Who are the Bayswater local authorities? Bayswater is represented by Westminster Council, which is responsible for delivering services in the area. These responsibilities include all council duties and services such as social services, education, housing and planning. How did Bayswater get its name? The area of Central London now known as Bayswater was originally owned by the Abbey of Westminster according to the Domesday Book. During this time, the most famous tenant to live here was Bainiardus, who is believed to be the same Norman associate under William the Conqueror, who was the namesake of Baynard’s Castle. It is written that Bainiardus gave his name to springs located near Paddington called Baynard’s Watering, the first record of which was in 1380. There is no clear trace of the descent of land held by him; however, his name remained associated with Baynard’s Watering place for several centuries afterwards, and now takes the abbreviated form of Bayswater. What is the history of Bayswater? In the 17th century, Bayswater was a small hamlet in the parish of Paddington. For several centuries, Bayswater was looked down upon by the wealthy residents of London for being on the wrong side of Hyde Park. However, towards the end of the 18th century – following the removal of the Tyburn Gallows in 1783 – Bayswater was becoming more favourable. During the early 19th century, Bayswater was being rapidly developed into a high class residential district with several grand squares and terraces of Tyburnia being built in Bayswater. The opening of the Great Western Railway at Paddington in 1838 was another contributor to the rapid development that ensued in this area, and Bayswater grew from here onwards, with an influx of wealthy residents. During the late 19th century, the social character of Bayswater began to converge, with several shops opening and the population becoming more cosmopolitan. William Whiteley, the founder of Whiteleys department store, started his business in 1863 in Westbourne Grove of Bayswater, and kept acquiring shops here and turning them into departments. The number of hotels, boarding or lodging houses and apartments also multiplied during this period, to provide cheap accommodation for Whiteleys’ staff and railway travellers. In 1879, the consecration of a synagogue in the St Petersburgh Place took place, followed by a Greek Orthodox cathedral consecration in 1882 in Moscow Road. These changes took place in particular streets – the rest of Bayswater such as Porchester Gardens, Cleveland Square, Kensington Gardens and Lancaster Gate, and the area from Westbourne Terrace to Inverness Terrace had wealthy residents. Places such as Leinster Place and Terrace and Craven Terrace as well as Eastbourne Terrace to the east and Queen’s Road (now Queensway) to the west were considered merely well off. In between the World Wars, most of Bayswater remained expensive and more and more of the area was gradually taken over for hotels or flats. The 650-flat council estate – Hallfield estate was designed by Sir Denys Lasdun and built after the 2nd World War, on land between Bishop’s Bridge Road and Cleveland Square. In the decades after the 2nd World War, Bayswater – like most other areas that surround mainline stations – went into a decline and fell from grace, with decaying houses being split up into seedy bedsits, tacky hotels and gimmicky tourist souvenirs. Gentrification over the past half century has boosted Bayswater. With an influx of Arab, Jewish, Brazilian and American population into Bayswater, along with government grants, the area began transforming into the cosmopolitan area of London that we now recognize today. Paddington is undergoing a vast regeneration project, and Whiteleys has been reopened as a smart shopping centre to serve Bayswater residents. One of the first successful projects was the redevelopment of a former hotel on Bayswater Road, which was initially 15 Victorian town houses. This is now ‘The Lancasters’ – an impressive 77 apartments, which has sold over £3,800 per square foot! Following this success, Bayswater is now an area in demand for high-end property. Developers are now buying cheap hotels in Leinster Square and Westbourne Grove and converting them into luxury flats and apartments. Approximately 75% of properties along Queensway, including Whiteleys has been purchased by a Brunei billionaire, with a master make over plan being drawn up to create an urban village that is said to become the Covent Garden of West London in a few years, complete with refurbished luxury homes, new apartments, and a retail boulevard. What is the population and community like in Bayswater? Bayswater has a population density of 17,500 per sq km, and currently has over 10,000 residents based on the latest population figures. In terms of age population proportions, 77% of residents are working age adults (16 – 65 years) whilst 13% are under 16 years old and 10% are over 65 years. Majority of residents (approximately 50%) in Bayswater have lived here between 3 – 10 years, with 20% of residents living here for over 20 years. Bayswater is cosmopolitan and diverse, with a wonderful mix of cultures. According to the 2011 census, the main ethnic group in Bayswater is White British (37%) with a significant Western European (9%) and Arab (5%) population. Other residents include Mixed Europeans, Africans, Chinese, Indians, Irish, Australians, Greeks, Italians, Bangladeshis and more, making Bayswater a melting pot of diversity. Bayswater is also home to London’s largest Brazilian community and many Americans. Majority of the population speaks English (74%), with other main languages spoken here being Arabic, Japanese, French, Farsi and Spanish. What sort of property can I find in Bayswater? What about their prices? Bayswater is largely a residential area with pretty streets and garden squares, with property ranging from small studio flats to expensive apartments. It is home to a range of apartment buildings with long streets of white Victorian stucco terraced buildings that are 4 or 5 stories high, majority of which are split up into flats. These flats are studio apartments to spacious 2 – 4 bedroom apartments. There are also inter-war period apartments that were purpose built and the 650-flat Hallfield estate which was built after the 2nd World War. Bayswater also has brand new contemporary apartment blocks for those who are looking for more edgy property. Bayswater has approximately 5,500 residential properties, with majority of residents (41%) renting property from landlords or letting agencies rather than owning outright (19%) or owning with a mortgage (15%). In terms of renting in Bayswater, the median average rent for a one bedroom household was £425 per week, whilst rent for a two bedroom household was £550 in February 2014. The average property price in Bayswater is currently worth £1,199,847 according to Land Registry data for March 2015. Flats on the first floor tend to be more expensive since they have balconies and high ceilings. Studio apartments are approximately £350,000; two bedroom flats are sold for an average of £1,160,000, whilst four bedroom properties sell for £3,200,000. Property prices are rising, and will soon reach levels similar to Notting Hill and Marylebone. If you are looking for properties for sale in Bayswater, then check out Lancaster Gate, Cleveland Square, Palace Court, Kensington Gardens Square and the Westbourne Park area. If you are considering properties for sale in Bayswater, consider using the services of established estate agents in Bayswater. Fun fact: Leinster Gardens in Bayswater has a fascinating quirk – Houses No. 23 and 24 do not actually exist, and are simply a false façade that blends in perfectly with adjacent properties. These ‘properties’ are actually a 5 ft thick wall with painted windows that hides the London underground line there. What are the transport options in Bayswater? Bayswater is centrally located and well connected with the rest of London and its surroundings. Located to the north of Hyde Park and near London’s West End, Bayswater has several excellent transport links that provide easy access in and throughout London. Nearest Tube Stations: The nearest London Underground stations in Bayswater are Bayswater, Queensway, Lancaster Gate and Royal Oak. Bayswater underground station is located on the District and Circle Lines, whilst Queensway and Lancaster Gate are situated close by on the Central Line. Proximity to Paddington Station: Bayswater station is less than a mile away (4 mins by train, or a 15 min walk) from the extensive Paddington station, which has several tube lines and overland trains to the suburbs, West of England and Wales. In addition, residents at Bayswater will benefit from Paddington Station’s very useful Heathrow Express, which is the quickest way to get to London’s main airport – just 15 minutes from Paddington to Heathrow, with trains departing every 15 minutes. Buses: There are extensive bus services in the area with regular runs along Bayswater Road which provide links to major shopping areas of Oxford Street, Regent Street, Edgware Road and Kensington High Street. Buses provide access to major areas of London and beyond. Crossrail: Crossrail – a new rail line that will link London from east to west connecting several suburban towns and cutting travel times significantly – is set to open in 2018. Residents from Bayswater will be able to use it via Paddington to reach Canary Wharf in just 15 minutes! Walking/Cycling: Residents who work in the West End, Kensington and Knightsbridge will be able to walk or cycle to work. What are the best schools in Bayswater? Bayswater has quite a few schools in its area, as well as the vicinity of the City of Westminster. Schools here fall under the Westminster Local Education Authority. In addition, a few primary schools run nursery classes too. Where do I go shopping in Bayswater? If you are considering buying or renting property in Bayswater, do not fear – Bayswater is a shopaholic’s paradise with ample shopping opportunities available nearby. The heart of shopping is without a doubt Whiteleys Shopping Centre, which was developed in Bayswater in 1912, and has grown from strength to strength over the decades. Other options include Westbourne Grove, Queensway, Westfield Shopping Centre and more. Whiteleys Shopping Centre: Situated right in the centre of Bayswater is Whiteleys Shopping Centre – London’s first department store and one of the historic buildings in the area. Initially built in 1912, Whiteleys stocked everything possible – ‘from a pin to an elephant’. It was converted in the late 1980’s to a vibrant shopping centre, with stunning décor including a water fountain with two centaurs, a glass dome ceiling, a sweeping iron and marble stairway and marble flooring throughout the entire building. It offers a luxurious shopping experience with a wide range of items from fashion for women, men and children to gifts, books, accessories and beauty products, along with several international restaurants, a bowling diner, an 8 screen multiplex cinema and car park. Whiteleys is also famous for its fantastic Christmas decorations and Christmas tree during the festive period. Queensway: Formerly known as Queen’s Road, this is a bustling district in Bayswater that is well known for its restaurants, pubs, and shops. Whiteleys is situated near the northern end of Queensway, and the entire area has become a centre for leisure activities and entertainment with an ice skating rink too! Queensway Market is the main retail area here, and is bustling with stalls selling a variety of items such as fashion and accessories. Whether you are looking for designer clothes, antiques or souvenirs, you are sure to find them here. Other items that you can find in Queensway include bags and luggage, tourist merchandise, gifts, cards and more. Plans are underway to redevelop Queensway in the near future. Westbourne Grove: Situated in between Bayswater and Notting Hill is Westbourne Grove, a fashionable retail road area that is home to a wide range of luxury brand flagship stores, designer fashion boutiques, bag and shoe designers, luxury leather goods, organic foods, stationary shops, contemporary art, household goods and electrical appliances, laundry shops, hair salons, bespoke jewellers and more. It is fast becoming a lively and trendy area with lots of restaurants, clubs, bars and entertainment venues too, which is a perfect shopping accompaniment, and is popular with the young, designer conscious crowd with more well-to-do shops and restaurants. Shops can also be found on Edgware Road, Chepstow Corner, Notting Hill Gate, Connaught Street and The Porchester Centre. What are the best restaurants in Bayswater? Alanouk, Westbourne Grove: This busy and charming Persian restaurant serves tasty good amidst friendly and helpful services and nice décor. The lovely smell of bread made in the clay oven as you enter sets the tone of your meal. Make sure you try the lamb kebabs! Four Seasons Chinese Restaurant, Queensway: Although the atmosphere here is rather cramped and slightly shabby looking and the service can be improved, this is an excellent authentic Chinese restaurant that serves amazing food – make sure you try the roast duck here! Halepi, Leinster Terrace: This charming Greek restaurant is a small tavern that has tight seating, but delicious flavourful food that brings a smile to your face. Enjoy Greek specialities such as lamp chops, seafood grill and Greek salad served in a cosy environment that is decorated with traditional handmade fabrics. Khans, Westbourne Grove: This long established no frills North Indian restaurant is value for money, with excellent food that comes in quick. It is family oriented; serving traditional cuisine, similar to what one would eat at home. There is no alcohol served here. Be sure to tell the waiter that you want the food to be spicy and hot if you are used to eating spicy food. Mandarin Kitchen, Queensway: Mandarin Kitchen is a popular Chinese restaurant with a vibrant atmosphere, prompt service and excellent food. Be sure to try out the lobster noodles here. It is wise to make a reservation here, even on weekday evenings – a testament to how popular it is! Masala Zone, Bishops Bridge Road: Masala Zone is an award winning Indian restaurant that serves authentic and wholesome delicious Indian food, from street food to curries and tandoori grills. It is great value for money, with a good atmosphere and friendly staff. Try out the thali here. Patisserie Valerie, Queensway: This long-standing chain serves delicious coffee and light meals including fancy pastries and cakes. Rodizio Rico, Westbourne Grove: If you are craving endless meat in a fun, unique environment, then this Brazilian restaurant is the place to go to. Enjoy mouth watering Brazilian barbeque spit roasted cuts such as succulent lamb, steak, pork, chicken and sausages that are carved tableside – and you can request as much meat as you want. Although famous for meat, there is a delicious vegetarian offering too and a fresh buffet of quality salads and sides such as rice, tomatoes, potatoes, mushrooms, olives, bread etc. A meal here is value for money if you are a big eater; however drinks and desserts are pricey. Satay House, Sale Place: Satay House serves Malaysian cuisine in a modern scarlet room decorated with hibiscus stencils and teardrop lamps. Enjoy delicious cuisine such as Malaysian curries, prawn, rendang beef and laksa with a great authentic taste and a balance of flavour and spices. Sheila’s Sandwich Bar, Craven Terrace: This is a superb tiny local coffee shop that serves delicious bacon rolls and sandwiches with excellent prices – one of the best places for a lovely breakfast. The best part however is the friendly and engaging staff. What’s the nightlife like in Bayswater? 65 & King, Westbourne Grove: With terrific cocktails, food and staff, this is an excellent place to sit and chat with friends or your partner. All Star Lanes, Whiteleys Shopping Centre: This retro bowling alley is another great place to spend the evening, with a bar and diner with super service, food and amazing cocktails. King’s Head, Moscow Road: This unpretentious pub serves traditional pub food and real ales, and is a good place to watch sports. Mitre, Craven Terrace: This 1850s pub makes for the perfect night out with your friends with a good selection of drinks, and a warm and cosy vibe. Enjoy a ‘speakeasy’ style bar downstairs, original mosaic floors and beautiful etched glass décor. Odeon Cinema, Whiteleys Shopping Centre: This is a lovely way to spend the evening with loved ones, although it can be rather pricey. Enjoy a luxury cinema experience with comfortable reclining chairs, and cocktails and food brought to your seat while you enjoy excellent quality state of the art sound and projection. Prince Alfred, Queensway: This is a traditional Victorian bar with an upstairs sofa lounge which serves delicious pub dishes and pastas amidst live music. Redan, Westbourne Grove: This warm and relaxing pub situated on the corner of Westbourne Grove and Queensway has TV sports, comfort food and friendly staff. The Beachcomber, Queensway: Situated in between the Four Seasons restaurant and a money exchange, this basement restaurant and cocktail bar is the perfect place to hang out with great staff, ambiance and drinks. The Leinster Arms, Leinster Terrace: Enjoy a night out with your mates at this relaxed local pub with chalk board specials menus, screens for live sports viewing and a dark wood lined bar. The Swan, Bayswater Road: This 18th century inn has a lovely terrace and balcony bar that is over the road from Hyde Park, and has delicious comfort food and drinks. What are the best attractions in Bayswater? Hyde Park, London: This world renowned park is right next to Bayswater and is home to several famous memorials, statues and fountains and Speakers Corner. Enjoy self guided walks through this Royal Park of London, along with a range of leisure activities such as boating on the Serpentine, horse riding and Frisbee games, and see a variety of species of fauna and flora and more here. Hyde Park also hosts regular events such as Winter Wonderland, summer concerts and the Royal Gun Salutes. Kensington Palace and Gardens, London: Situated south of Bayswater and west of Hyde Park is Kensington Gardens, one of the Royal Parks of London. Enjoy sites such as Kensington Palace, Albert Memorial, Peter Pan Statue, gorgeous flower beds and trees, the Italian Gardens, the Serpentine Galleries and the Princess of Wales Memorial Playground here while you walk through the gardens. Marble Arch, London: One of London’s iconic landmarks, Marble Arch is situated close to Bayswater. This 19th century white marble arch was designed by John Nash to be the state entrance of Buckingham Palace, and was moved to its current location in 1851. Whiteleys Shopping Centre, Queensway: A visit to London’s first department store is a must with endless shopping, dining and leisure activities. Be sure to check out its original La Scala staircase, the glass domed atrium and Centaur’s Fountain here. Queensway, Edgeware Road and Westbourne Grove: If you are looking to experience cosmopolitan Bayswater, then these are the streets to visit. Queensway has several Chinese restaurants, whilst Edgeware has Lebanese cuisine and shisha joints. Westbourne Grove has all sorts of cuisine – from Greek to Malaysian available. These streets are complete with specialist shops. St. Sophia’s Cathedral, Moscow Road: This beautiful Greek Orthodox Cathedral was built in 1879 and is the oldest surviving Greek Cathedral in the capital. See material from the Greek community archives at the museum here, as well as treasures given to the church. New West End Synagogue, Saint Petersburgh Mews: This stunning grade I building serves the Jewish community in Bayswater. Be sure to visit and see the beautiful stained rose windows and inscriptions on the walls. Central popular location – close to Hyde Park, Kensington Gardens and all that London has to offer. Bayswater is moving up the property ladder – it is fast becoming one of the most desirable places to live in UK. It is a cosmopolitan hotspot with many foreigners investing – Arabs, Chinese, Greek, Americans, Brazilians. Beautiful properties here – buildings are being transformed into luxury apartments. Exciting new developments taking place soon – Crossrail to open soon, Paddington Regeneration Project, Queensway and Whiteleys transformation to an urban village. Great transport with several tube stations, close proximity to Paddington station, buses and more. Several shopping experiences from small specialist shops to large department stores. Wide range of restaurants with international cuisine and good nightlife. Great schools (nursery, primary, college) and facilities available. Excellent attractions to suit all preferences and ages. If you are looking for properties for sale in Bayswater, be sure to check out listings available at Cavendish Rowe – expert Bayswater estate agents in W2.